A molecule near the center of a volume of liquid is attracted by other molecules equally on all sides. Surface molecules, however, are unbalanced because there are no liquid molecules above them. So the tendency of any liquid surface is to contract inwards, towards the rest of the liquid. Drops tend to shape themselves so that they have as little surface area as possible. So, tiny mercury droplets are speherical (a sphere has the smallest possible area for a given volume). Larger, heavier drops are pulled out of shape by their own weight. Surface tension draws droplets of dew into spheres. Larger droplets are flatter. Surface tension effects allow a needle to be 'floated' in a glass of water or adapted insects to 'skate' on the surface of a pond. Surface tension is the force existing in any boundary surface of a liquid such that the surface tends to assume a minimum possible area. It is defined as the force perpendicular to a line of unit length drawn on the surface. 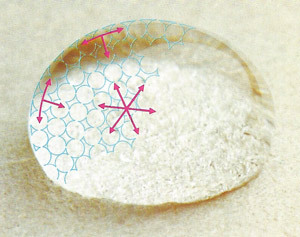 Surface tension arises from the cohesive forces between liquid molecules and from the fact that a molecule in the interior of a liquid is pulled equally from all sides by its neighbors, whereas a molecule at the surface is only attracted by molecules below it in the liquid; it makes a liquid surface behave as if it had an elastic membrane stretched over it. Surface tension is responsible for the formation of liquid drops and bubbles, and governs the wetting properties of liquids, capillary action, and the action of detergents. Water has an extremely high surface tension. Surface tension explains why a needle can be made to 'float' on water despite the fact that this is contrary to the laws of flotation (a metal needle cannot displace its own weight of water and should therefore sink). If the needle is placed carefully on the surface of the water there will be sufficient cohesion between the surface molecules (i.e. ability to stick together) to stop it breaking through the elastic 'skin'. A close look at the floating needle shows that it causes a depression in the surface of the water as though the skin has been stretched. But it does not sink very far, for a depression means extra surface area and this is just what the elastic skin is striving to avoid. Surface tension also explains why certain insects can skate across the surface of a pond. A surfactant is a substance that lowers the surface tension of a solvent in which it is dissolved. In water, soaps and detergents act as surfactants. Their molecules concentrate at the surface of oil and water molecules and act as emulsifying or foaming agents, to produce latherig and frothing.